This article is part of a series highlighting photographers who have submitted to Smithsonian.com’s annual photo contest. Jassen Todorov is a modern Renaissance man. Originally from Bulgaria, he travels around the world performing as a violinist, and for the past 15 years, has taught music at San Francisco State University. 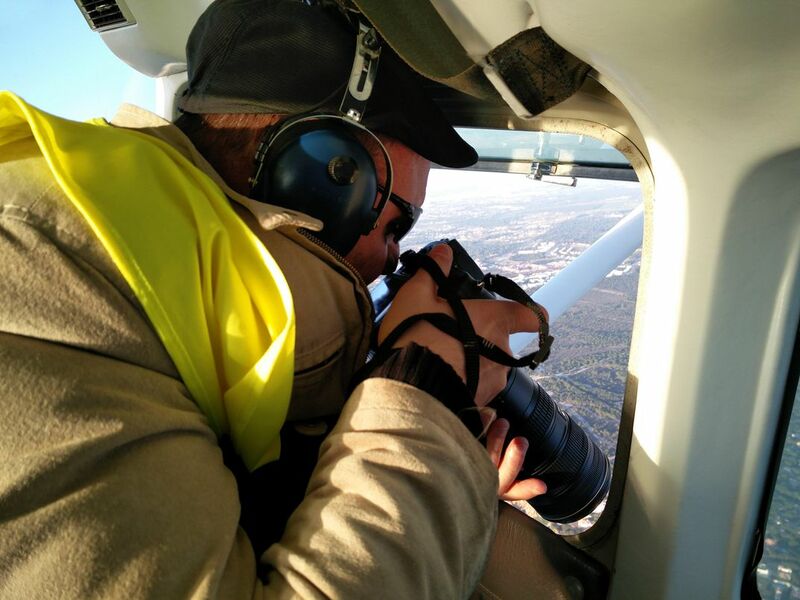 In between classes and concerts, he is also a pilot and photographer. Whether for a quick weekend trip from the Bay Area or a cross-country haul, Todorov travels in his four-seater 1976 Piper Warrior plane every chance he gets, documenting the world below. What started as a hobby quickly became a passion filled with purpose. In the past five years, he has flown over 20 states, as well as multiple countries, capturing views that others rarely see. From his vantage point, landscapes resemble abstract works of art, and human structures look like toy models. Spanning verdant national parks, mist-covered wind farms, industrial paper mills and sprawling, discarded automobile lots, his images offer a unique glimpse into the ways humans have shaped the planet. Speaking from San Francisco, Todorov shares how he combines his passions, what inspires his travels and what he has learned in his years of flying. Not only are you a musician and a professor, but you are also a pilot and photographer. Which came first, photography or flying? Oh, flying! In the early 2000s, I was a student in upstate New York. Music is wonderful, but one must be cautious not to overdo it, like with anything else in life, because it can burn you out if you do it too much. I used to practice six, eight hours a day while I was studying for my masters and doctorate degrees—and then I was teaching as a TA [teaching assistant]. I was very busy, but I needed some additional outlet. I thought, well maybe I can become a pilot, because this was always a passion of mine since I was a boy. Eventually, I got all of my certifications. I became a pilot, then an instrument pilot, a commercial pilot with a commercial license, and five years later I found myself teaching people how to fly planes here in San Francisco. At one point, I had more pilot students than violin students. Then I got my own plane. Around 2010. I bought a four-seater, single-engine plane. Due to its small engine size and light weight, it burns less fuel than most SUVs out there. My first DSLR I bought in 2013, and then in 2014 I decided to focus on taking pictures while flying my own plane without students. I took this one trip to Yellowstone National Park, and I mark it as the beginning of my photography career. A trip to Yellowstone and back to San Francisco? Yeah. It only takes about six hours to get there in my plane. I got to Idaho, and that first night I landed in an airport maybe 50 miles south of Yellowstone, and all the hotels were fully booked. I said okay well I’m just going to sleep in my plane. The back seat—you know, it’s actually quite comfortable. It was my first time camping out seeing the place, and I remember the stars were just awesome. It was one of those unforgettable first moments when you realize, wow, I need to be doing a lot more of this. I remember waking up, and it was this beautiful morning with an amazing sunrise. Once I looked over the Grand Prismatic, I felt like I was receiving this bolt of energy, flying like a bird over this magnificent nature. Long shadows at sunrise. Grand Prismatic Spring, Yellowstone National Park. Walk me through your process. How do you plan and execute a shoot? Do you fly with a destination in mind? In the beginning, there was so much to explore. Anywhere I looked there was so much beauty. I couldn’t sleep for months! I was just planning trips and taking trips one after another. The great thing about it is that many of my pictures got funded by media, newspapers, magazines all over the world, and I thought okay I need to do this more often and come up with thematic material for articles. The best time to photograph is in the early mornings or late afternoons. I’m always excited to get up in the mornings even though it’s really tough. Sometimes I get up at 5:00 am and then ride my bike for a couple of miles or walk to a nearby airport. When you are departing and the sun is also waking up, it’s just unbelievable. Todorov’s 1976 Piper Warrior at a fuel station. When I fly these days, I listen to a lot of music. Bach, Mozart, Beethoven or jazz… or country, sometimes, depending on where I am, or Ray Charles – anything that I feel like listening to in that moment. It’s so much fun because now I’m combining music with flying and photography. Does your work as a musician influence your work as a photographer? Music has a lot to do with patterns, and structure and discipline. But then there’s also uniformity, colors and improvisation too. When you look at a photo, you’re thinking about the same things. You are looking at colors, you’re looking at the mood, you’re looking at the patterns. You’re looking at the composition of course, the general feel. As a pilot what are some of the height restrictions that you work with? For example, how high do you have to fly over national parks? We are in communication with towers, with air traffic control. For national parks, national forests or monuments, we are advised to fly 2,000 feet above the ground, and then over cities or congested towns, it’s usually about 1,000 feet above. Uncongested or out in the middle of nowhere, 500 is okay too, but you never want to fly that low. You want to have more room between you and the ground because anything can happen. If you’re at 5,000 feet, or 3,000 feet, you have more time to look at a possible place to land to glide and then land safely. With the exception of a few military restricted air space areas in some of the deserts of California—there are some in New Mexico, quite a bit in Nevada and Arizona too—most of the U.S. airspace is very friendly for pilots. You’re at least a few thousand feet above these sites. Technically, how do you get these shots? What equipment do you use? Are you tilting the plane while photographing? Yes, I’m tilting the plane, and that’s one of the reasons why I like to fly by myself because there have been instances when people get sick when they fly with me. Your stomach to deal with, and your stomach only. Right. A few friends that I’ve taken in the past, I think they feel like [they’re on a] Six Flags wild ride, and then, you know, we have to look for a barf bag. These days I only use one camera and one lens. In the past, I used to have more lenses, and that’s too complicated. Now I use just a 70-200mm lens and NikonD810, which I find is a wonderful camera. I use my hand to dampen so that there are no plane vibrations; in other words, I don’t rest it on the plane. I have two windows now on both sides of the plane. I used to have only one window, but then I installed a second window so that if I fly, and then I see really something very interesting on the other side, I can just quickly switch the seat and then take a photo without having to turn the plane and make a 360-degree turn. I just open the window, tilt the plane, take the picture, and continue. Sometimes I’ll take two or three pictures just in case from different angles, then if there is a site that is really fascinating, I’ll circle. I’ll tell the tower that I’ll be circling there for a couple of minutes. As long as you talk to them and tell them what your intentions are, it’s no problem usually. Grand Canyon is a tricky one. They have special rules because there’s a lot of air traffic. You have to study them and make sure you understand the charts. But most of the other national parks are okay, usually. Grand Canyon is the busiest of all. When you’re flying to these different states and different countries, you’re photographing a range of landscapes. What can we see from the sky that we can’t from the ground? How can aerial photography help us see the world differently? So it’s both very beautiful and very sad. It’s very sad because there’s a lot of destruction. I see a lot of that on a large scale. For example, in December 2015, I flew to Florida. I covered 13 states on that one trip, and I flew especially around Texas, Louisiana and the Gulf of Mexico area. That’s a really tragic place. The water is not clear at all; it’s very contaminated. They say that they’ve cleaned up after the BP explosion a few years ago, but it’s not just that. There are thousands of oil rigs on the ground and also in the water, and there’s a lot of leakage from many of these platforms. I witnessed in South Africa last year huge areas of coal waste. The same in the U.S. Whenever there’s a big coal factory, there’s a lot of waste, too. We have this bad habit of dumping things just in the water or into the rivers. Sometimes I’ll photograph something, and I don’t even know what I’m photographing. There was an area in Colorado that was so interesting, so red and so colorful from above. I stumbled upon it and I took a few photos—it was up in the mountains in the Rockies—then I came back, and I researched it. It turns out that this was a gold mine that was highly contaminated. Is there one trip that has been particularly memorable? Yellowstone is memorable because it was the first. You always remember your first. There have been many amazing trips. Too many to count at this point. I must say, though, that California is the most interesting out of all states because here you have the ocean, you have the coastline, you have valleys, you have populated areas and also many remote areas. You have glaciers, you have high mountains, deserts, and probably my #1 place, if I had to pick, is the Death Valley area. It’s quite amazing… We have it all here [in California]. I can go surfing in the morning, and I can go skiing in the afternoon. And then I go to the desert in the evening and look at the stars and then look at Mount Whitney. This kind of contrast, I don’t think I’ve found it anywhere else. Two brave souls walk on the edge of massive dunes in Death Valley National Park, California. Surfers navigate the waters of Half Moon Bay, California, during the Mavericks surfing event. What or where do you want to photograph next? Eventually I’d like to photograph all of the U.S., and that will take a while because it’s a big country. I’d also like to photograph more of other continents. Asia is a continent I haven’t photographed much at all. I need to go back to Africa one of these days. South America is fascinating, and the Andes would be amazing too—and Australia would be great. There are just too many to count! I always joke that I’d love to photograph the moon one of these days. How cool would that be. Or Mars. Through my photos I really want to send this message to those who are viewing the photos that we are so fortunate we have this glorious nature and beautiful Earth. We discovered Jassen Todorov’s work through his submissions to our photo contest. Join now to become part of our photo community!